The foods you eat play an important role in how effectively your nervous system operates and consequently how relaxed or stress you feel throughout the day. High sugar and refined grain foods negatively affect your blood sugar levels and can generally be considered stress promoting. Conversely, natural foods like vegetables, nuts and healthy protein sources are much slower digesting and usually provide a calmer and significantly more stable energy. 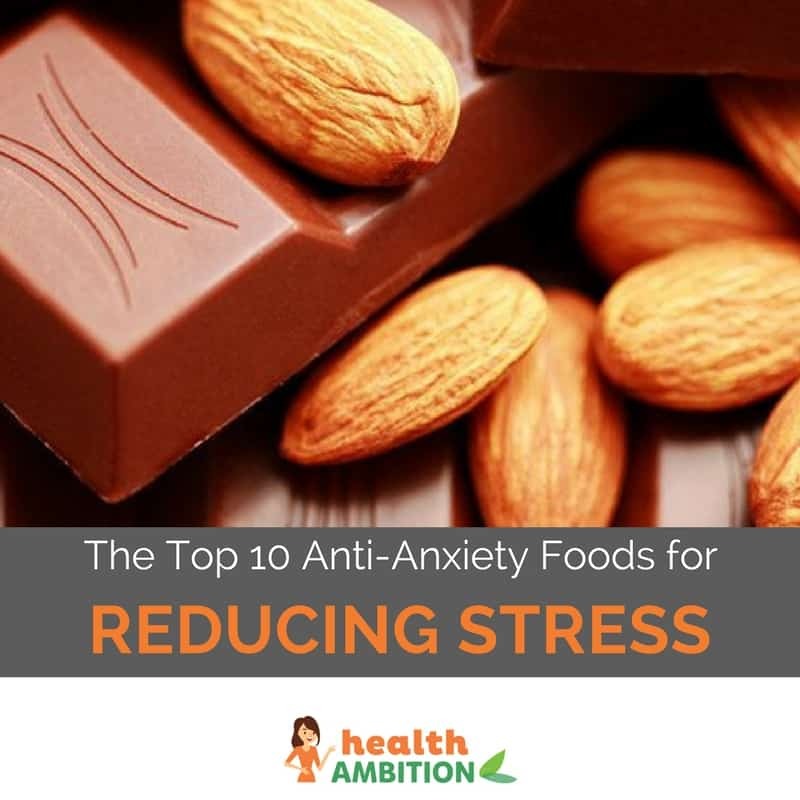 Even eating a healthier diet though, there a certain anti-anxiety foods that are particularly good at reducing stress levels and relaxing your body and mind. Ahead are ten of the best and what makes them so good for relieving anxiety and tension. Raw and importantly unsalted pumpkin seeds are an amazing source of anti-anxiety nutrients. They are particularly effective if you replace sugary or salt laden junk food snacks with a small handful of pumpkin seeds (perhaps mixed with the two nuts coming up ahead). Pumpkin seeds are rich source of magnesium, a mineral vital for maintaining a healthy nervous system, regulating energy production and relaxing your body’s muscles. Many people are at least mildly deficient in magnesium as it is often processed out of packaged foods and soil levels are low in most Western countries. Magnesium deficiency may well contribute to anxiety and is known to stimulate food cravings (unfortunately often for the wrong kinds of foods). Raw pumpkin seeds like these are also a good source of other important minerals like iron, copper and zinc. Additionally, they contain high gamma-tocopherol vitamin E, vitamin K, B vitamins for mental relaxation and particularly high levels of protein alongside very low carbohydrates. All of these nutritional elements make them a very healthy snack and a premier anti-anxiety food. Delicious avocados are surprisingly good for you and have some valuable nutritional properties for reducing stress. They are a great source of anti-inflammatory and blood sugar stabilizing monounsaturated fatty acids, the same fats that makes olive oil so healthy. Monounsaturated fats in the diet tend to reduce blood sugar spikes that lead to anxiety and are particularly beneficial for your cardiovascular system and heart. Avocados are also especially high in potassium (even higher than bananas without the fruit sugar), which helps keep blood pressure low and prevent hypertension. With inflammation reducing antioxidants like vitamin E and C, folate and other B vitamins for your brain and good levels of dietary fiber for your digestive system, avocados are one of the best foods for relieving stress and anxiety. Raw, unsalted and preferably organic almonds like these are another excellent snack for stabilizing blood sugar levels and improving your overall health in general. High in protein and full of vitamin E and a variety of B vitamins (particularly B2 for stable energy production), almonds are a nutritious and delicious food for keeping your day running on a smooth and even keel. Dark leafy greens are excellent for improving your body’s response to stress and helping your internal systems to function optimally. Swiss chard is particularly good as it contains antioxidant betalains, shown to help protect your body against both high blood pressure and elevated blood sugar. Add to this its rich vitamin (vitamin A, C, E and K) and mineral content (magnesium, calcium, potassium and iron) and you have a very powerful stress fighting food. One of the healthiest ways to use leafy greens like Swiss chard, spinach or arugula for reducing anxiety in your day is to make your lunch with these as the base rather than insulin spiking grain products like bread or pasta. What I like to do is top off a bed of fresh greens with free range turkey or chicken, grass fed beef or wild salmon. Add a few pumpkin seeds or walnuts, chop over some avocado or tomato and dress with a little avocado oil and apple cider vinegar. It tastes great, keeps you going all afternoon and you be hard-pressed to make a better anti-anxiety meal. Omega-3 rich salmon is an excellent food for your body and brain. Omega 3 fatty acids have been shown to balance out inflammatory polyunsaturated fats and even reduce excessive cortisol levels. Cortisol is a hormone associated with both physical and psychological stress but a good intake of omega-3 fats can help to keep it in check. Salmon is also a good source of vitamin D for mood enhancement and stress management. High levels of anxiety will drastically reduce vitamin D stores in the body and a significant percentage of people are believed to be deficient in this vital nutrient, particularly over winter. Another high omega-3 food, walnuts are a great tasting snack and add a potent dose of nutrition whenever you include them in your meals. Particularly good for brain health, the nutrition in walnuts, like high levels of vitamin E, alpha linolenic acid and phenolic compounds, help prevent mental decline as you age and have even been recommended to assist in treating mild depression. Walnuts are also a source of melatonin which helps regulate natural sleep patterns. Obviously getting a good night’s sleep will have a big bearing on how much stress and anxiety you feel the next day. Eating more of the foods on this page in the evening, along with less sugar and refined grain products which cause your energy levels to spike and crash, can definitely help if you have been having trouble sleeping. Turkey is particularly high in the amino acid tryptophan that promotes serotonin production. It’s best to source free range turkey where possible to avoid potential health issues associated with bizarre diets of production lot poultry. A small serving of turkey on a salad or slow digesting vegetables should lead to a feeling of calmness and relaxation after eating. Too much turkey though may make you sleepy, as I’m sure many people have found after Thanksgiving dinner. Highly alkalizing and detoxifying, fresh lemon juice in water is especially good for you first thing in the morning. The high levels of vitamin C in citrus fruit like oranges and lemons are known to help lower blood pressure and stabilize elevated cortisol for minimizing anxiety and stress. Be wary though of drinking commercially produced orange juice for your vitamin C. It’s so high in sugar it will almost certainly have the opposite effect. While high levels of grains in the diet aren’t recommended for reducing anxiety, oats make a good replacement for wheat with its many health issues. Oatmeal promotes serotonin production for a relaxed mood, with slower digesting steel cut and rolled oats far better than finely cut ‘instant’ oatmeal. The healthiness of your chocolate is directly related to how much sugar is in it. Regular milk chocolate is so full of sugars and unhealthy vegetable oils that the recently lauded health benefits of chocolate are almost certainly overpowered by the damaging effects of these additives. True dark chocolate (at least 70%) on the other hand can be good for you and particularly your mood in moderation. As well as been exceptionally high in stress reducing magnesium, dark chocolate contains l-theanine, a natural physical and mental relaxant that leads to come state of alertness without drowsiness. For the highest levels of l-theanine and magnesium, I like my chocolate very high in cacao. This 90% dark chocolate has a rich and velvety flavor that really lasts. Once you get used to real dark chocolate like this, regular milk chocolate tastes weak and far too sickly sweet. There’s 10 exceptional stress reducing foods for bringing natural relaxation and calm energy into your day. Feel free to add any others that you recommend in the comments below. As important as having nutritious foods like these in your diet is, one of the simplest ways to reduce stress quickly is to get some exercise. It can be a simple is heading outside and walking at a good pace for 10 minutes. Combine regular exercise with these anti-anxiety foods and it won’t be long before stress and tension start playing less and less of a part in your daily life.